Emile Engbarth (1855-probably 1905), the founder of the Engbarth Family at Ocean Springs, was born at Texas in October 1855. His father was William Engbarth (1824-1880+) who was born at Feilbingert, Rheinland-Pfalz, Germany near the city of Bad Kreuznach. Emile’s mother was Pauline Schmidt. She was born at Prussia in 1833, and appears to have died before 1880. From the census data, it can be deduced with reasonable certitude that the William Engbarth family moved to Rodney, Jefferson County, Mississippi from Texas or Louisiana between 1856 and 1862. In 1870, William Engbarth was a merchant probably a retail grocer at Rodney, Jefferson County, Mississippi. The Engbarths’ children were: John (1851-pre 1880), Emile (1855-c. 1905), Charles (1858-1862), Josephine (b. 1862), Eddie (b. 1866), Idella (b. 1867), Arnold (b. 1868), and Pauline (b. 1871). William Shaw (b. 1850), a stepson and carpenter, born in Louisiana is living with them. Emile Engbarth took the 1870, 1880, and 1900 US Census at Rodney, Mississippi, which is an indication of his intelligence and education. From census information, it can be inferred that John Engbarth (1834-1878), probably a brother of William Engbarth, was married to Delia Knopp. She was born in Germany in December 1847. She had married John Engbarth in 1868, and had three children. Minnie Engarth (b. 1876), a daughter lived with her at Rodney. Delia Engbarth worked as a seamstress. In 1881, Emile Engbarth married Magalene Jeanette Arndt (1856-1938) probably at Rodney, Mississippi. Magalene, called Lena, was born March 1, 1856, in Mississippi, the daughter of George E. Arndt (1827-1882) and Caroline Russi (1832-1880). They were born at Alsace-Lorraine, France and Heidelberg, Germany respectively. It is believed that the Arndts had immigrated to America landing at New Orleans in the 1850s. They settled at Rodney as early as 1854. The other Arndt children were: Mary Arndt O’Brien (1854-1906), George E. Arndt, Jr. (1857-1945), Michael A. Arndt (1859-1887), Henry Arndt (b. 1863), Emma Arndt Meyer (1864-1938+), and Bettie Arndt Brook (b. 1865). Emile and Lena Arndt Engbarth had nine children. In 1900, the following eight were alive: William J. Engbarth (1882-1957), George Engbarth (1883-1938+), Charles M. Engbarth (1885-1962), Rodney Engbarth (1887-1966), Carolina Amelia "Carrie" Engbarth (1889-1972), Montana Pauline "Monte" Engbarth (1891-1932), Katherine Engbarth (1892-1970), and Claude Engbarth (1893-1967). In 1900, Mrs. Lena Engbarth was the postmistress at Rodney. Louise E. Muelling passed on February 12, 1965, while residing at 525 Porter. All four members of the William J. Engbarth family are buried at the Evergreen Cemetery, Ocean Springs, Mississippi. Ruth Anne Barrett furnished these notes from her grandmother, Irene Effie Hopkins Engbarth, which were made in 1975, when Mrs. Irene H. Engbarth (1890-1984) was at the age of 85 years: In 1913, we, Irene and Charles E. Engbarth, moved to Ocean Springs and lived on Martin Avenue in a rented cottage, right next door to Grandma Engbarth, Lena P. Arndt. In 1915, we bought the lot where Charles Edward Engbarth built his shop used for his plumbing and heating contractor business. In 1916, we built the house on that lot. Grandma Lena P. Arndt Engbarth moved to Willie Engbarth’s house about 1920. Willie was married and his wife died when Louise Engbarth was two years old. His wife had tuberculosis. Willie and Louise went to live with Grandma Engbarth. Willie never married again. Louise married Joseph Muelling. Willie lived with Louise and Joe Muelling until he died. Willie Engbarth is buried in the Evergreen Cemetery, Engbarth plot. Before he Willie died, he gave Louise the house, and when Louise died, Joe Muelling got the house. He sold it for $40,000. Buried in the Engbarth plot are: Louise and Joe Muelling, Willie Engarth, Montana Engbarth Cadenhead , Claude Engbarth, Joe Engbarth, Grandma Lena Engbarth, and __?__(one other, according to my mother). The Charles E. Engbarth home was bought by Dandy Lion, Inc. in November 1975. The Dandy Lion was a business partnership between Maria Mavar and her sister, Joan M. Butirich (1933-2003). Circa 1970, they operated a gift shop in Ocean Springs located in Deedy's Shopping Center on Thorn Avenue. After purchasing the Charles E. Engbarth home on Ames Avenue in 1975, they relocated here. The Dandy Lion was discontinued in 1980. (JXCO, Ms. Land Deed Bk. 548, p. 305) With the announcement by the Mississippi State Highway Department in 1996, that Bienville Boulevard would be widened on the north side to accommodate the increase in traffic flow on that thoroughfare, Miss Mavar employed house mover, Ronnie Rogers, to relocate her building. The Engbarth bungalow was relocated to 1304 Government from 1105 Ames Avenue on May 12, 1997. Starks Contracting of Biloxi refurbished the structure for Miss Mavar. She has utilized it as a commercial rental property. On The Menu, a Hyla Sorenson-Weiss enterprise, was the first tenant. After Mrs. Sorenson-Weiss acquire the Carter-Lunceford property at 1209 Government in February 2001, Art and Soul, a gift boutique, relocated into the Engbarth House circa September 2001. Mrs. Irene Engbarth worked as a circulation agent for The Daily Herald at Ocean Springs. Her home, "The Myrtles", on Ames Avenue served as the circulation department for The Daily Herald at Ocean Springs for more than thirty-five years. Mrs. Engbarth took over the route from her son, Charles, when he joined the Marines in 1935. She retired in 1968, and moved to the Villa Maria, a subsidized Roman Catholic retirement complex on Porter Street in Ocean Springs. Returning from military duty, Charles married Evelyn Perez (1912-1965) in May 1940. In October of the same year, Engbarth completed a course at the Maritime Commission at New York. The Charles Engbarths lived on 402 Claiborne at Biloxi. Mr. Engbarth later worked as mechanic for United Novelty (1949), marine radio operator (1951), and then as a merchant marine radio officer retiring circa 1968. In 1965, he was serving aboard the S.S. Tyson Lykes probably out of New Orleans. They had a son, Charles E. Engbarth (1941-1975). All members of this family are buried at Biloxi City Cemetery. In 2001, Evelyn Engbarth Barrett related the following about her brother: My brother Charles Engbarth completed the 11th grade and that summer with Mom's signature, since he was under age, joined the Marines in 1933. I was 5 years old and remember that he had to go to New Orleans to join, and we met him at the train at the Ocean Springs L&N Railroad depot on his way to Parris Island and told him "good bye." He was not in the service very long when he received an "Honorary Medical Discharge." Charles came home and took treatments for his sinus condition with a doctor in Gulfport, who told him that the best thing was to get a job "on the sea." Charles Engbarth then went to New Orleans to Radio School and upon graduating with the second highest grade in the school's history; he immediately started his career as a Radio Operator aboard freighters with the Lykes Steamship Line. His first assignment was on the S.S. Stella Lykes and he stayed aboard that ship for many years. When he came home for a month or so on vacation, many times he would help out by repairing the jukeboxes and slot machines. Later on he got a full-time job doing that while waiting for another ship to sail. I think Charles was on several different ships of the Lykes Brothers Shipping Lines. He was also on a ship(s) with the Grace Shipping Lines; I do not recall the name(s) of the ship(s). During WWII he was aboard a ship, which I think was the S.S. Stella Lykes in a convoy, which escorted troops, supplies, and ammunition in the North Atlantic waters safely across to Europe. They had no mishaps. He may have been in several of those convoys! This may have been the build-up in England for the eventual invasion on the mainland. This is when Charles Engbarth became a "Merchant Marine." Charles Engbarth was also on the S.S. Rueben Tipton of the Lykes Lines for a while after the war. One of the ships he was on had a delivery in the South Pacific near Australia. He was home "on vacation" and the ship, which he had just left hit a mine, which had been left over from WWII. The ship sank. I believe it was the S.S. Rueben Tipton*. * The S.S. Rueben Tipton was sunk on October 23, 1942 by U-129, a German submarine, while off the coast of Trinidad. The vessel was in route from Colombo, Ceylon, now Sri Lanka, to New York with a cargo of chrome ore, rubber, and coconut oil. On May 17, 1924, R.J. Engbarth married Hattie Miller (1896-1986), the sister of R.C. Miller (1887-1953), who was later the mayor of Ocean Springs. They honeymooned in Columbia, Mississippi. Miss Miller worked for The Jackson County Times beginning in 1922. The Joe Engbarths had no children. They divorced in June 1934. Hattie later married Julian Duran from Birmingham, Alabama. Hattie Miller is buried in the Crestlawn Cemetery, Ocean Springs. (The Jackson County Times, May 24, 1924 and Jackson County, Mississippi Chancery Court Cause No. 5594-June 1934). In February 1940, Carrie E. Dancer granted a four-year lease to Mrs. Ira Lovell to operate a filling station on her property. The rental consideration was to be a sum equal to one cent for each gallon of gasoline sold by Mrs. Lovell from her station each month during the term of the lease. Lessee had the right to use the gasoline pump, tank, and air compressor belonging to the lessor. Again, Mrs. Dancer exempted from the lease, the garage business operated by her brother, Claude Engbarth. It appears that Mr. Engbarth utilized the northwest corner of her building for this operation. "Carrie and her husband, Fred, got old and his family went down to the coast and got him and she went into a nursing home. Back then, in the 1960's, the nursing home was just a big, old house. I remember visiting her. She'd never cut her hair and it was down to her ankles when she stood up, but she rarely did that. She lay in her bed and moaned, "I just want to die." In 1965, Hurricane Betsy was headed toward the Gulf Coast, so my mother, Margaret Burkley Marshall, drove down to the Coast and got Aunt Carrie & took her back to Natchez whre she put her in Glenburnie old folks home. They immediately cut off all her hair and Aunt Carrie continued to lie in her bed moaning, "I just want to die." In 1971, my little brother, Buck, who at that time was in Junior High School, didn't want to ride the bus after school, so my mother suggested that he go visit Aunt Carrie every day after school and she'd pick him up from there. He did. He went every day. It wasn't long before she was getting the staff to help get her up from her bed, into a wheel chair, washing her hair, etc. She'd say, "My nephew is coming to see me." He only stayed 1/2 hour or so, but it made her day. At the end of the school year, he stopped going to see her every day and it wasn't long before she was back in her bed all the time. Carrie Engbarth expired at Natchez, Mississippi on November 2, 1972. Internment was in the Natchez City Cemetery. The Cadenheads resided at Meridian and Jackson, Mississippi, where Mr. Cadenhead was affiliated with the Mississippi Life and Casualty Insurance Company. They had one child, L. Charles Cadenhead Jr. The Burkleys had three children: Stanley Engbarth "Billie" Burkley (b. 1926), Joseph Emile "Jack" Burkley (1928-1975) and Margaret Jeanette "Jean" Burkley Marshall Ferney (b. 1928). Stanley E. Burkley (b. 1926) married Ruth Marie Miller, Gasquet Jeanne Despujols, and Terry Elaine Tisdale. Children with Ruth M. Miller: Stanley Burkley, Louis Burkley, and Mattie Burkley. Children with Gasquet j. Despujols: Camille Burkley (b. 1965) and Simone Burkley (b. 1967). Joseph Emile Burkley (1928-1975) married Betty Bush and Alice Henderson. Children with Betty: Mimi Burkley and Katherine "Kit" Burkley. Children with Alice: Rodney Melton Burkley, Mitzie Jo Burkley, Sherry Ann Burkley, and Regina Burkley. Katherine E. Burkley expired at Natchez on August 29, 1970. No further information. In March 1933, Claude Engbarth (1893-1967) bought a lot described in the warrant deed as: part of Lot 2, Block 28-Culmseig Map (1854) in Section 19, T7S-R8W. Here on Government Street, Claude Engbarth commenced a restaurant, which evolved into Henrietta’s Café, a local landmark, which closed in 1995, after fifty-two years of continuous operation by Henrietta Beaorivich C. Bellew Savage (1911-1999). Claude Engbarth and Audrey V. Webb divorced in 1941. She married Preston J. DeSilvey (1911-1982) of Biloxi, who was possibly a brother of Ralph DeSilvey (1925-1983), her son-in-law. In the 1950s, they lived at 649 Laurel Court in Biloxi. (JXCO, Ms. Chancery Court Cause No. 6448, May 1941). Claude Engbarth may have later married the daughter of Sallie Green Guillotte (1906-1962) and the spouse of Ernest Guillotte, of Pascagoula, Mississippi. (The Daily Herald, October 29, 1962. Ray L. Bellande, Ocean Springs Hotels and Tourist Homes, (Bellande: Ocean Springs, Mississippi), p. 54 and p. 56. Thomas G. S-Wixon and Jean Strickland, Mississippi Masonic Death Records (1819-1919), Book 1 (A-G), (Wixon-Strickland: Pascagoula, Mississippi-1991), p. 13. Biloxi City Directory, "Engbarth", (Mullin Kille Company: Bradford-O'Keefe Funeral Records Book 24-A, (Biloxi Public Library History and Genealogy Archives), p. 297. The History of Jackson County, Mississippi, "George Edward Arndt", (Jackson County Genealogical Society: Pascagoula-1989), pp. 111. The History of Jackson County, Mississippi, (Jackson County Genealogical Society: Pascagoula-1989) "Clark-Reinike House", p. 56. Jackson County, Mississippi Chancery Court Cause No. 3457, "Will of Mrs. Ellen Clark", February 1915. Jackson County, Mississippi Chancery Court Cause No. 5594, "Hattie Engbarth v. Rodney J. Engbarth", June 1934. Jackson County, Mississippi Chancery Court Cause No. 6448, "Audrey Engbarth v. Claude M. Engbarth", May 1941. Jackson County, Mississippi Chancery Court Cause No. 12594, "Elva Mae Anderson v. Claude M. Engbarth", June 1954. Jackson County, Mississippi Chancery Court Cause No, 18264, "Will of Louise Engbarth Muelling", April 1965. The Daily Herald, "Dancer-Engbarth", December 1, 1911, p. 4. The Daily Herald, "A Wedding of Interest", January 5, 1926, p. 2. The Daily Herald, "Cadenhead-Engbarth Wedding", May 28, 1927, p. 2. The Daily Herald, "Ocean Springs News Paragraph", June 3, 1929. The Daily Herald, "Cadenhead to Face Charges", November 11, 1929, p. 1. The Daily Herald, "Cadenhead in Jail, Unable to Raise Bond", November 14, 1929, p. 1. The Daily Herald, "Cadenhead Indicted For Obtaining Money On false Pretense", March 13, 1930, p. 10. The Daily Herald, "Cadenhead Released In Scooba Bank Case", November 4, 1930, p. 2. The Daily Herald, "Mrs. Cadenhead Dies", October 31, 1932, p. 2. The Daily Herald, "Ocean Springs", December 29, 1932. The Daily Herald, "Ocean Springs", May 11, 1935. The Daily Herald, "Mrs. (Lena) Engbarth Dies", November 28, 1938, p. 3. The Daily Herald, "Miss Engbarth To Be Hostess on New L&N Streamlined Train", February 20, 1941, p. 14. The Daily Herald, "Miss Evelyn Engbarth (photo)", March 26, 1951, p. 5. The Daily Herald, "Charles E. Engbarth", July 3, 1962, p. 2. The Daily Herald, "Claude Engbarth", March 1, 1967, p. 2. The Daily Herald, "Retired Seaman Found Hanged", November 13, 1968, p. 2. The Daily Herald, "Engbarth home former office for Daily Herald", July 4, 1976, p. E-7. The Daily Herald, "Mrs. Irene Engbarth", December 11, 1984, p. A-2, c. 2. The Gulf Coast Times, "Barrett-Engbarth Wedding Claims Wide Attention", June 14, 1951. The Gulf Coast Times, "Mr. and Mrs. Arthur James Barrett Jr.", June 21, 1951. The Jackson County Times, "Local News Items", May 5, 1917. The Jackson County Times, "Local News Items", January 5, 1918. The Jackson County Times, "Local News Items", September 7, 1918. The Jackson County Times, "Local News Items", February 22, 1919. The Jackson County Times, "Local and Personal", June 17, 1922, p. 5. The Jackson County Times, "Local and Personal", January 6, 1923. The Jackson County Times, "Local and Personal", May 24, 1924. The Jackson County Times, "Cadenhead-Engbarth", June 4, 1927, p. 1. The Jackson County Times, "Burkley Twins", February 25, 1928, p. 2. The Jackson County Times, "B.J. Noel Dies", April 25, 1942, p. 1. The Jackson County Times, "Muelling-Engbarth", June 19, 1943. The Jackson County Times, "J.B. Muelling Has new Connection", November 6, 1943. The Jackson County Times, "Local and Personal", December 22, 1945. The Jackson County Times, "Local and Personal", June 7,1947, p. 8. The Ocean Springs News, "Local News", September 11, 1909. The Ocean Springs News, "Local News", November 13, 1909. The Ocean Springs News, "Local News", November 20, 1909. The Ocean Springs News, "Local News", December 25, 1909. The Ocean Springs News, "Local News", February 26, 1910. The Ocean Springs News, "Mrs. William J. Engbarth Passes Away", April 30, 1901, p. 1, c. 5. The Ocean Springs News, "Local News", March 26, 1910. The Ocean Springs News, "Local News", December 10, 1910. The Ocean Springs News, "R.A. Dancer Passes Away", April 15, 1915, p. 1, c. 3. The Ocean Springs News, "Local News", May 13, 1915. The Ocean Springs Progress, May 14, 1904. The Ocean Springs Record, "Former Essex Agency Falls to Progress", January 7, 1971, p. 1. The Pascagoula Democrat-Star, "Ocean Springs Items", February 4, 1881. The Pascagoula Democrat-Star, "Ocean Springs Locals", October 5, 1900. The Times-Picayune, '[Montana] Cadenhead', October 31, 1932, p. 2. FEDERAL CENSUS-Jefferson County, Mississippi (1860, 1870, 1880, and 1900). FEDERAL CENSUS-Jackson County, Mississippi (1900, 1910, and 1920). Kathy Marhsall Moody-April 11, 2001. The Clark-Engbarth House is located at 525 Porter in Section 25, T7S-R8W, and rests in the southeast corner of an approximate three acre tract composed of Lots 21-28 of Block 13 (Culmseig Map 1854). Early land records indicate that Edward W. Clark of Philadelphia, Pennsylvania sold this parcel of land to A. J. Whitfield in June 1888. (1) Whitfield left Ocean Springs and was residing at San Luis Potosi, Mexico in April 1888, when he conveyed his Porter Avenue property to Newcomb Clark. (2) The Clark lot was part of the Plummer and Bowen tracts which consisted of the 1854 Culmseig Map Blocks 11 thru 21. Newcomb Clark (1836-1913) was a native of Sullivan County, New York. At an early age, his family moved to Oakland County in southeastern Michigan. In 1857, Clark taught school at Port Gibson, Mississippi. When the Civil War commenced, he returned to Michigan where he enlisted in the 14th Michigan Infantry. In May 1863, Newcomb Clark resigned from the Union Army to care for his unwell mother. By this time, he had achieved the rank of First Lieutenant. Clark returned to the military in late 1864, to command the 102nd U.S.C.T., the only African-American unit from Michigan. With the cessation of hostilities in the Spring of 1865, Clark had attained the rank of Lieutenant Colonel. After the Civil War, Newcomb Clark located to West Bay City, Michigan. Here he married Ellen Chambers (1843- 1915), a native of Atherton Settlement, Michigan. Clark was very active in civic affairs at West Bay City. He officiated as president (mayor), tax assessor, recorder, and postmaster here. In 1883, Newcomb Clark won a seat in the Michigan State Legislature running as a Republican. During his four year term, he was selected as Speaker of the House. In 1888, the Clarks moved to Ocean Springs. It is believed they came South to escape the harsh winters of Michigan, and for Newcomb to speculate in real estate. At Ocean Springs, Colonel Clark was very active in real estate. He owned land at present day East Beach, the Fort Bayou area, and scattered tracts throughout town. In the early 1890s, the Clarks sold large estate tracts from the James Fitch Bradford patent (Lots 2-3, Section 32, T7S-R8W), on East Beach to two Chicagoans, lumberman, James Charnley, and Albert Sullivan, General Superintendent of the Illinois Central Railroad. Renown architect, Louis Henri Sullivan (1856-1924), with the assistance of his apprentice, Frank Lloyd Wright (1869-1959), designed and built summer cottages for himself and Charnley here, which are extant. The Clark-Reinike House on Porter Avenue was built in 1904. The Progress, the local journal, announced on May 14, 1904 that "Newcomb Clark is clearing a lot on Porter and preparing to erect a cottage". The Clarks were residing at "Poplar Glen" in 1894 and "The Poplars" in 1898. At present day 525 Porter, Colonel Clark built a Queen Anne-Stick Style two-story, wood frame residence with a gable roof. The front eave featured imbricated shingles. Through the years renovations have enclosed the side porch with glass, added vinyl siding, and altered the front entrance. The Pascagoula-Democrat Star reported in October 1906, that "Ocean Springs will lead this winter in automobiling. Mr. Fred Benjamin and Colonel Newcomb Clark have purchased autos which are in transit to our town". In April of the same year, that very journal stated that "Dr. H.B. Powell is quite to the force in his possession and use of the first auto. He is a very considerate chauffeur and no accidents have yet occurred". Orey A. Young, Jr. (1892- 1986) contended that his father, Orey A. Young (1868-1938), owned the first automobile at Ocean Springs. It was a 1905 Oldsmobile. The garage where Colonel Clark stored his "Reo" is still extant. It now serves as a cottage at the rear of the Reinike House. William J. Engbarth (1882-1957), called Willie, was the son of Emile Engbarth (1855-c. 1905) and Magalene Jeanette Arndt (1856-1938), called Lena. Emile Engbarth, the progenitor of the Engbarth family at Ocean Springs, was born at Texas. His father, William Engbarth (1824-1880+), was born at Feil Bengart?, Bavaria, Germany. Emile's mother was Pauline ? She was born at Prussia in 1833, and appears to have died before 1880. From the Federal census data, it can be inferred with reasonable certitude that the William Engbarth family moved to Rodney, Jefferson County, Mississippi probably from New Orleans between 1856-1862. In 1881, Emile Engbarth married Lena Arndt probably at Rodney. Lena was born March 1, 1856, the daughter of George E. Arndt (1827-1882) and Caroline Russi (1835-pre 1880). They were born at Alsace-Lorraine, France and Heidelberg, Germany respectively. It is believed that the Arndts settled at Rodney, Mississippi as early as 1854. Emile and Lena Arndt Engbarth had nine children. In 1900, while she served as postmistress at Rodney, the following eight Engbarth siblings were alive: William Engbarth (1882-1957), George Engbarth (1883-1938+), Charles Engbarth (1885-1962), Rodney Engbarth (1887-1966), Carrie E. Dancer Meyers (1889-1967+), Montana E. Cadenhead (1891-1932), Katherine E. Stanley (1892-1970), and Claude Engbarth (1893-1967). A cousin to the Engbarth's, Marie Arndt Alexander (1905-1994), writing in The History of Jackson County, Mississippi (1989) states that her father, George E. Arndt Jr. (1857-1945), came to Ocean Springs on May 17, 1881, from Rodney, Mississippi to be with his sister, Lena Engbarth. The Engbarths must have moved to Ocean Springs from Rodney as they were there for the 1880 US Census. Emile Engbarth was the postmaster at Ocean Springs from 1885 to 1889. As the Emile Engbarth family was again residents of Rodney, Mississippi in 1900, it appears that they returned to Jefferson County, possibly when Engbarth's postmastership terminated here. After the demise of Emile Engbarth probably in 1905, the Engbarth family moved to Ocean Springs again. They arrived circa 1906. In April 1907, the Engbarths' cousin, George E. Arndt, bought the Emmett Ernest Clement House diagonally across Porter from Newcomb Clark. E.E. Clement (1861-1922) and family relocated to Ashville, North Carolina. Our newest upscale eatery, The Porter House, is located in the remodeled Clement House, which was erected in 1894. It is believed that the Engbarth family rented the Clement House from George E. Arndt, until the death of Ellen Chambers Clark in 1915. Then, William Engbarth inherited the Clark House on Porter Avenue, and the family moved there. photo caption: THE NEWCOMB CLARK HOUSE (525 Porter)-Built in the Summer of 1904, this two-story, wood framed structure was the home of Colonel Newcomb Clark (1836-1913) and his spouse, Ellen Chambers (1843-1915). Clark, a native of Sullivan County, New York, was reared in Michigan. He taught school at Port Gibson, Mississippi in the Ante-Bellum days. Clark fought with the Union during the Civil War. He commanded the only black military unit, the 102nd U.S.C.T., that Michigan mustered during this conflict. In their twilight years, the Clarks were cared for by their new neighbors, the Emile Engbarth family from Rodney, Mississippi. Before her passing in 1915, Mrs. Clark legated her home to William Engbarth (1882-1957). The home has been known for decades as "the Engbarth Home" because of their long tenure here (1915-1972). William Engbarth (1882-1957), called Willie, had married Mamie Flannery (1887-1910) circa 1907. He worked at Matt Huber's Pharmacy in the Farmers and Merchants State Bank Building on Washington Avenue. A daughter, Louise Engbarth (1908-1965), was born in 1908. Circa 1916, Willie Engbarth, his widowed mother, Lena Engbarth, and her children occupied the Newcomb Clark house at 40 West Porter. A brief history of the remainder of the Engbarth children follows:George M. Engbarth (1883-1938+) was residing at Detroit, Michigan in 1938. No further information.Charles Edward Engbarth (1885-1962) learned to be a tool and die maker in his youth. At Ocean Springs, he made his livelihood as a plumbing and heating contractor. Engbarth managed the mechanical contracting on the Ocean Springs High School built on Government Street in 1927. He married Irene Hopkins (1890-1984), a native of Bayou des Allemands, Louisiana. They resided at 1105 Ames Avenue, and reared two children, Charles Lester Engbarth (1914-1968) and Evelyn Carol Barrett (b. 1928). Mrs. Barrett now resides at Merrimack, New Hampshire. The Charles E. Engbarth home, "The Myrtles", on Ames Avenue was moved to 1304 Government in 1997 by owner Maria Mavar, and refurbished by the Stark Contractors of Biloxi for commercial rental purposes. The first tenant, "On The Menu", a kitchen gallery, will have its ribbon cutting ceremony here Friday, April 24th. Rodney Joseph Engbarth (1894-1966) was called Joe. Joe Engbarth was a nursery man-landscaper and house carpenter. His greenhouses and equipment were located to the rear of the Clark-Reinike House. Joe Engbarth married Hattie Miller (1896-1986), the sister of R.C. Miller (1887-1953), a former Mayor of Ocean Springs. They divorced without children in June 1934. Carrie Engbarth (1889-1967+) married R. Anderson Dancer (1878-1915) at Ocean Springs on November 30, 1911. He was born at Buenavista, Chickasaw County, Mississippi and moved to the Mississippi Coast at an early age. Dancer was in the motion picture and mercantile business at Ocean Springs. His store may have been located on the southeast corner of Washington and Porter. Carrie E. Dancer remarried Fred Meyers, and was residing at Pass Christian in 1962. She was at Ocean Springs in 1967. No further information. Montana Engbarth (1891-1932) graduated from the Touro Infirmary at New Orleans as a nurse circa 1926. She married Louis Charles Cadenhead, a broker and entrepreneur, from Memphis, Tennessee. They lived at Meridian, Mississippi, and had one child, L. Charles Cadenhead Jr.. Mrs. Cadenhead passed at New Orleans in October 1932. Her remains were brought to Ocean Springs for interment. Katherine Engbarth (1892-1970) married Stanley Milton Burkley of Natchez, Mississippi in December 1925, at Ocean Springs. They had three children: Stanley (Billie) Burkley (b. ca 1924), Jack Burkley (b. 1928) and Margaret "Jean" Burkley Marshall (b. 1928). Katherine E. Burkley expired at Natchez in August. No further information. Claude Engbarth (1893-1967) made his livelihood at Ocean Springs as an auto mechanic, machinist, auto salesman, and electrician. He was an Essex-Hudson auto dealer from June 1922, until he closed his Washington Avenue garage.Claude Engbarth married Audrey Webb (1914-1991). They divorced in May 1941. He espoused Elva Mae Anderson in 1944, at Jackson, Mississippi. They had a daughter, Claudia E. Eyer. Claude Engbarth expired on February 28, 1967. Willie Engbarth sold his West Porter Avenue home to his daughter, Louise E. Muelling (1908-1965) on February 6, 1957. Louise was an only child. As a young person she excelled at dance. In February 1941, Miss Engbarth was selected by the Southern Railroad to be a hostess on the train which ran between New Orleans and New York. She married Joseph B. Muelling (1894-1976), a native of Louisiana. Muelling made his livelihood by selling industrial cleaning products. They were childless. Joseph B. Muelling inherited the Clark-Engbarth house after the death of his wife in 1965. He remained in the house for several years before he sold it to Rolland and Frances S. Gardner in July 1972. Rolland Gardner, called Tony, was in the USAF stationed at Keesler AFB. The Gardners had three children: Randy, Rusty, and Tracy. The Gardners remodeled the Clark-Engbarth home as they installed central heat and air conditioning, glassed in the screened side porch, and painted and wallpapered many of the rooms. When the Gardners were transferred to Germany, they rented their home to as an antique store, Magnolia Gallery Antiques, for several years. During Hurricane Elena in September 1979, Ron Hawksley was the proprietor of the shop. The Gardners sold their home in May 1984, to Vernon R. Reinike about one and one half years after returning from active duty at Europe. Vernon Robert Reinike was born at Gulfport, Mississippi in 1942. He attended the University of Southern Mississippi at Hattiesburg where he met and later married Stephanie Anne Chavez (b. 1943) of New Orleans and Biloxi. The Reinikes moved to Ocean Springs soon after their nuptials in 1967, settling initially at the Fort Bayou Estates Subdivision. Their two sons, Vernon R. "Rob" Reinike, Jr. (b. 1970) and RyanS. Reinike (b. 1977), were born at Biloxi. Rob Reinike is a recent petroleum engineering graduate of Mississippi State University and is employed in the securities business at Jackson. Ryan is a student at Jeff Davis Community College. He has written and produced an original play, "They Don't Know What Love Is". Ryan has appeared in many Little Theater productions on the Mississippi Coast, and with cohorts is writing a musical, "Midnight Delirium", a potential Broadway production. Vernon R. Reinike degreed in business administration and finance, worked initially for NASA at Hancock County. After a few years in the life insurance industry, he joined Ingalls Shipbuilding at Pascagoula. Today, Vernon is a planning section manager in New Business and Contracts for the corporation. In the 1970s, he was active in the Jaycees and reported the news of that organization for The Ocean Springs Record as, "Jaycee Jottings" Stephanie C. Reinike received a degree in Secondary Education and English. She has taught at several schools in the area. Stephanie is active in genealogy and history. She was regent of the D.A.R. (1992-1995), and president of the Ocean Springs Genealogical Society (1984). Mrs. Reinike is also a member of the Beach Garden Society, Friendship Civic Club, a board member of the Biloxi Garden Council. .
Vernon Reinike utilizes the glassed in sun porch on the west side of the house as his art studio. He is an accomplished painter being a long standing member of the Ocean Springs Art Association and Art Wave. Vernon was recognized in 1991, by Coast Magazine as one of the top artists on the Coast. He paints primarily with the acrylic media in an impressionistic style. Reinike is also a recognized art educator. His "Spectrum Palette" technique has jump started many beginners towards understanding the mixing of colors. Vernon Reinike designed the Iberville Statue which was dedicated in December 1970, at Marshall Park. It was removed to the Civic Center in the early 1990s, when Marshall Park was restored by HOSA. Since their occupancy of the old Newcomb Clark House in 1984, the Reinikes have painted the shutters, trim, and wall papered and painted several rooms. They have researched the various owners of their home and have a good knowledge and some artifacts of the families that have shared the same roof and walls since 1904. Although we disagree on the exact age of their home, the Reinikes are to be lauded for the depth of their investigation into the chronology of their domicile. I thank them kindly for sharing this knowledge with me and the community. photo caption: Colonel Newcomb Clark (1836-1913)-Born at New York State, Newcomb Clark was reared in southeastern Michigan, near Detroit. After a Civil War military career and successful life as a politician and businessman at West Bay City, Michigan, Clark and his wife, Ellen Chambers (1843-1915), came South in their later years to live in a milder climate. The Clarks settled at Ocean Springs in 1888. Here Newcomb Clark engaged in land speculation. In the early 1890s, Mr. Clark sold some of his East Beach property to James Charnley, an affluent Chicago lumberman. Here Louis H. Sullivan (1850-1926) and/or Frank L. Wright (1869-1959) designed a cottage which is extant at 509 East Beach Drive. Newcomb Clark suffered a paralytic stroke while on vacation at Chicago in September 1911. He expired at Ocean Springs two years later. It is believed that the remains of Mr. and Mrs. Newcomb Clark are interred in the Evergreen Cemetery at Ocean Springs.credit: COURTESY OF VERNON R. REINIKE AND STEPHANIE CHAVEZ REINIKE, PROPRIETORS, CLARK-REINIKE HOUSE. 1. Jackson County Chancery Court Deed Book 9, pp. 337-338. 3. ----------------------------- Will Book 2, pp. 253-254. 4. ----------------------------- Deed Book 166, p. 531. 5. ----------------------------- Will Book 8, pp. 417-420. 6. ----------------------------- Deed Book 436, p. 19. 7. ---------------------------------- Book 791, p. 38. Ray L. Bellande, "The Engbarth Family", (unpublished essay), February 1995. Regina Hines Ellison, Ocean Springs, 1892, (Second Edition), (Lewis Printing Services: Pascagoula-1991), pp. 87-88. C.E. Schmidt, Ocean Springs French Beachhead, (Lewis Printing Services: Pascagoula-1972), p. 101. The History of Jackson County, Mississippi, "Clark-Reinike House", (Jackson County Genealogical Society: Pasagoula-1989), p. 56. Daily Herald, "Miss Engbarth To Be Hostess on New L&N Streamlined Train", February 20, 1941, p. 14. Ocean Springs News, "Death of Mrs. N. Clark", April 29, 1915, p. 1. Ocean Springs Record, "An Old Find", September 20, 1979, p. 2. Pascagoula Democrat-Star, "Ocean Springs Local News", June 22, 1894. Pascagoula Democrat-Star, "Ocean Springs Locals", April 6, 1906, p. 3, c. 5. Communication: Vernon and Stephanie Rienike-April 16, 1995. On May 12, 1997, you may have been inconvenienced by the traffic jams created, when this old treasure was moved from its original site at 1105 Ames Avenue to its new resting place at 1304 Government. Thanks to the owners willingness to forego demolition of the structure, as a result of the widening of the north side of Bienville Boulevard (US 90 West), and the sage decision of the towns' aldermen to declare the house an historic structure, a valuable link in our architectural history was preserved. As you may recall, highway construction and expansion at Ocean Springs has been a necessary evil since the early 1950s. The latest project of this magnitude was probably the erection of the third Fort Bayou bridge, dedicated in late 1985. Another very valuable property, the Geiger-Friar Queen Anne cottage saved by HOSA in 1989, now owned by Gulf National Life, and situated at 611 Jackson Avenue, was moved to Washington Avenue circa 1952, when US Highway 90 was relocated from Porter and Government to its present position. A history of our latest conservancy from the jeopardy of growth, the property known as the Charles E. Engbarth House, follows: The Charles E. Engbarth House was situated at 1105 Ames Avenue and U.S. 90 in the SE/4 of the SW/4 of Section 19, T7S-R8W. The original lot size was 180 feet by 170 feet, but today it is somewhat irregular having a front on Ames Avenue of about 82 feet and 155 feet on U.S. 90. Originally patented by the U.S. Government to Andre Fournier III (1809-1878) in December 1849, the future Engbarth lot was in the possession of Frederick Mason Weed (1850-1926) in 1912. In May 1917, The Jackson County Times reported that the Engbarth boys, Charles and Joe, were cultivating ground at the corner of Railroad and Ames Avenue. The land owned by Charles Engbarth was low and usually covered with water. He fenced and drained it. Together the brothers had one of the most attractive gardens in the city. They grew potatoes, corn, beans radishes, lettuce, onions, and strawberries. The Engbarths also had a young pecan nursery on the lot. From this journal information it appears that Charles E. Engbarth built his home after May 1917 and before 1919. Local historian, J.K. Lemon, relates that Mr. Engbarth told him that he built his own home. It is a one-story, wood framed, bungalow style structure with an area of 1885 square feet. The front gable building features two, small gable windows and three, corbel decorative, eave struts.The original home had a small covered porch with an area of 100 square feet on the south side. The south side of the house also had a private entrance, as a room was let here to itinerant railroad men, a common practice at Ocean Springs during this time. It appears that later facade renovations of the Enbarth House have included the porch to be glassed in, and the addition of a small portico or colonnaded porch. The erector of this Ames Avenue bungalow, Charles Edward Engbarth (1885-1962), was the son of Emile Engbarth (1855- c. 1905) and Magalene J. Arndt (1856-1938), the daughter of German immigrants, George E. Arndt (1827-1882) and Caroline Russi (1835-pre 1880). The Engbarths married in 1881, probably at Rodney, Jefferson County, Mississippi. Emile and Lena Engbarth had nine children. In the 1900 U.S. Census, eight children were still living: William Engbarth (1882-1957), George Engbarth (1883-1938+), Charles Engbarth (1885-1962), Rodney Engbarth (1887-1966), Carrie E. Dancer Meyers (1889-1967+), Montana E. Cadenhead (1891-pre 1938), Katherine E. Burkley (1892-1967+), and Claude Engbarth (1893-1967). Mrs. Engbarth was the postmistress at Rodney, in 1900. The Engbarths moved to Ocean Springs from Rodney circa 1881. 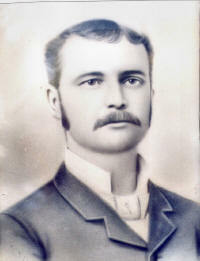 Emile Engbarth was the postmaster at Ocean Springs from 1885 to 1889. The family returned to Rodney before 1900. The Pascagoula Democrat-Star announced on August 31, 1900, that well known Republican, Emile Engbarth, was in Ocean Springs and rumored to be the new postmaster. His appointment never came as Thomas I. Keys (1861-1931) remained in this capacity until March 1911. After the demise of Emile Engbarth circa 1905, the Engbarth family moved to Ocean Springs permanently, probably in 1907. The family lived initially on the southeast corner of Porter and Martin Avenue in a house erected, commencing in January 1894, by John Duncan Minor (1863-1920). Mr. Minor was building for Emmett Ernest Clement (1861-1922), an insurance agent from Michigan, who was active in local politics and the Masonic McLeod Lodge No. 424, until he sold to George E. Arndt (1857-1945), the brother of Mrs. Engbarth, in April 1907. Mr. Clement relocated to North Carolina. The old Clement-Capers property is undergoing major renovations, demolition, and refurbishment by the Jacobs-Cole families who will operate an upscale restaurant, The Porter House, here in the near future. Charles E. Engbarth (1885-1962) was born at Rodney, Mississippi. As a youth, he learned to be a tool and die maker at Vicksburg. At Ocean Springs, he made his livelihood as a plumbing and heating contractor. Mr. Engbarth was the contractor who installed the plumbing and heating in the Ocean Springs High School built on Government Street in 1927. His plumbing shop, a one story wood-framed structure of approximately 1500 square feet was located on Reynoir Street in the extreme southwest corner of the Engbarth lot. It faced south towards the L&N depot. On June 10, 1913, Charles E. Engbarth married Irene Hopkins (1890-1984), a native of Bayou des Allemands, Louisiana. They had two children: Charles Lester Engbarth (1914-1968) and Evelyn E. Barrett (b. 1928). Mrs. Irene Engbarth worked as a circulation agent for The Daily Herald at Ocean Springs. Her home on Ames Avenue which she called, "The Myrtles", served as the circulation department for that journal at Ocean Springs for more than thirty-five years. Mrs. Engbarth took over the route from her son when he joined the Merchant Marines in 1933. She retired from the newspaper in 1968. Charles Lester Engbarth (1914-1968) made his livelihood initially as a merchant marine whose service he enlisted in 1933. He married Evelyn Perez (1912-1965) in May 1940. The Engbarths had a son, Charles E. Engbarth (1941-1975). The family resided at 402 Claiborne in Biloxi. Engbarth later was employed as a mechanic for United Novelty (1949), and as a marine radio operator (1951), before returning to the Merchant Marine service. In 1965, Engbarth was serving as the radio officer aboard the S.S. Tyson Lykes, probably out of the port of New Orleans. He retired circa 1968. All members of this family are interred at the Biloxi City Cemetery. After WW II, the population of the Mississippi Gulf Coast began to increase rapidly. This put a demand on the infrastructure which caused the Mississippi Highway Department to enlarge the highway system in the area. A decision to move U.S. 90 west and north of its path through down town Ocean Springs was made. Circa 1949, the Mississippi Highway Commission began purchasing land along the route of the proposed new roadbed. In April 1951, the Engbarths sold .45 acres (108 feet by 180 feet) from the south portion of their Ames Avenue tract to the Mississippi Highway Commission.(6). The deed specified that the garage (20 feet by 82 feet), which was probably the old plumbing shop, old scales, and septic tank and sewerage pipes be removed. Nineteen pecan trees were removed from the Engbarth lot to build the highway. Mrs. Engbarth planted crepe myrtles to give some privacy to her home site. She adopted the appellation, "The Myrtles", for the Engbarth bungalow at this time. The resulting lot dimensions from the 1951 conveyance to the Mississippi Highway Commission remain today. In old age, Mrs. Engbarth could no longer maintain her home, and she moved to the Villa Maria on Porter Avenue. The Charles E. Engbarth home was bought by Dandy Lion, Inc. in November 1975. (7) The Dandy Lion was a business partnership between Maria Mavar and her sister, Joan Mavar Butirich (1932-2003). Circa 1970, they operated a gift shop at Ocean Springs in Deedy'sShopping Center on Thorn Avenue. After purchasing the Charles E. Engbarth home on Ames Avenue in 1975, they relocated here. The Dandy Lion was discontinued in 1980. Since 1980, the old Engbarth home has been utilized as a commercial building. The last lessee, Kathleen Tynes Interiors, had been here since about 1988. Tynes is now located further eastward on Bienville Boulevard. In December 1986, Maria Mavar and Joan M. Butirich bought the old Joseph Catchot family home from the heirs of Sam Guagliardo. (8) It was located just north of the Engbarth home on Ames. The two-story dwelling which was built by Joseph A. Catchot (1861-1927) circa 1914, was demolished circa 1991. Regardons! The Government Street renaissance continues. Since March 1992, when Lynn Linenberger, now of San Mateo, California, refurbished the June VanCleave cottage (c. 1905) at 1302 Government, as "The Old Blue House Restaurant" (now the "Todd Boswell Salon"), there has been a fairly consistent level of refurbishment or building activity on this old artery, once called County Road. With the creativity and tenacity of Marilyn Lunceford, "Favorites: Books, Art, etc. ", occupying the historic Carter-Miller cottage (c. 1900) at 1209 Government, has become a microcosm of local culture since August 1993. The Richard T. Furr family has become the biggest player on the street, called Government. Their Magnolia Square professional office complex erected in 1994, was followed by the refurbishment of the Young-Shanteau Garage, now titled, Palmetto Place, at 1202 Government, in 1995. "Artifacts", dealers in antiques, art, contemporary furniture, and hand woven carpets, opened for business here in April 1996. The Furrs' latest enterprise, the revival of the post WW I, Young-Steelman building at 1210 Government, and the construction of an addition to this historic structure has just been completed. The Bayview Gourmet of Mary Ratliff commenced its food service on June 21st, while the law offices of Daphne Pattison and Sarah Berry, and office of Richard White, art conservator, opened earlier this month. A signature of the Furr enterprises is the ceramic art tiles of Margaret Furr Barnett of Richdale, Missouri, which decorate the facades of their structures. The Pelham Building, a replication of the original P.J. Wieder garage building (c. 1920), at 1025 Government was completed in early May 1997. Jerry Pelham offices his Crystal hamburger business in the upstairs space. Downstairs, Peggy Pelham anticipates opening an art gallery and atelier in the future, while Lady Di's, a floral gallery, occupies the other ground floor space. Renovation of the old Foretich grocery store building, most recently, "Ruth & Babs-This & That", at 1106 Government, is now in progress. A "Thrift Shop" is anticipated here shortly. A preservationist and restorationist at heart, Miss Mavar should be lauded by the citizens of Ocean Springs for her efforts through the years in maintaining the historical and architecturally significant Engbarth House. All efforts and caution should be exercised in maintaining the interior and exterior character of this precious jewel in the crown of our dwindling historic structures. Starks Contracting will complete the refurbishment of the building at its new location. The edifice will probably be utilized as a commercial rental. photo caption: THE CHARLES E. ENGBARTH HOUSE-This historic bungaloid arrived at 1304 Government, its new home, from 1105 Ames Avenue on May 12, 1997. Starks Contracting recently laid brick piers to support the structure and will complete refurbishment of the building during the coming months. Future utilization of the edifice is anticipated as commercial rental property.credit: RAY L. BELLANDE HISTORIC OCEAN SPRINGS COLLECTION. 1. Jackson County Land Deed Book 38, p. 501. 2. ------------------------ Book 41, p. 402. 3. Jackson County Land Roll Book 1915-1916, p. 307. 4. Jackson County Land Roll Book 1917-1918, p. 318. 5. ------------------------ Book 88, pp. 57-58. 6. Jackson County Land Deed Book 460, p. 365. 7. ------------------------ Book 548, p. 305. 8. ------------------------ Book 877, p. 91 and 93. 9. ------------------------ Book 991, p. 866. Ray L. Bellande, "The Emile Engbarth Family", (unpublished essay), February 1995. Daily Herald, "Engbarth Home Former Office For Daily Herald", July 4, 1976, p. E-7, cc. 1-3. Jackson County Times, "Local News Interest", May 5, 1917. Sanborn Map Company (New York), "Ocean Springs, Mississippi", (1925)- Sheet 4. E. Barrett-January and September 1995.